Childfree singles and couples often wrestle with being a minority in a child-oriented world. Whether childless by choice or circumstance, not being a parent can create challenges not always recognized in a family-focused society. Women feel the pressure of a real or imaginary biological clock ticking. Careers, biology, couples priorities and timing influence the end result, and not everyone is destined for parenthood, though there is a subtle assumption that everyone should be. In Complete Without Kids, licensed clinical psychologist, Ellen L. Walker, examines the often-ignored question of what it means to be childfree and offers ways to cope with the pressure, find a balance in your life and enjoy the financial, health and personal benefits associated with childfree living. A comprehensive resource on the rewards and challenges of childree living from a unique, unbiased perspective. A licensed, clinical psychologist, Ellen L. Walker, PhD interviewed childfree adults, men and women, couples and singles, gay and straight, to create a thought-provoking book that sheds light on behind-the-scenes factors that influenced their personal journeys away from parenthood. Childfree herself, Dr. Walker shares the doubts and questions that inspired her to write a useful and supportive guide to a subject often not addressed socially. 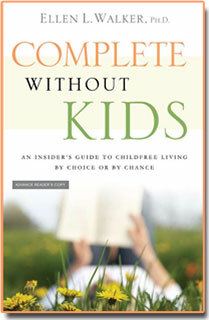 Complete Without Kids is a resource for any reader considering the joys and challenges of a childfree life path. A fulfilling life is within reach.